Boulder Startup Week is jam-packed with activities, so it’s important to have a place to retreat to and recharge. The place to do so is Basecamp at Galvanize. 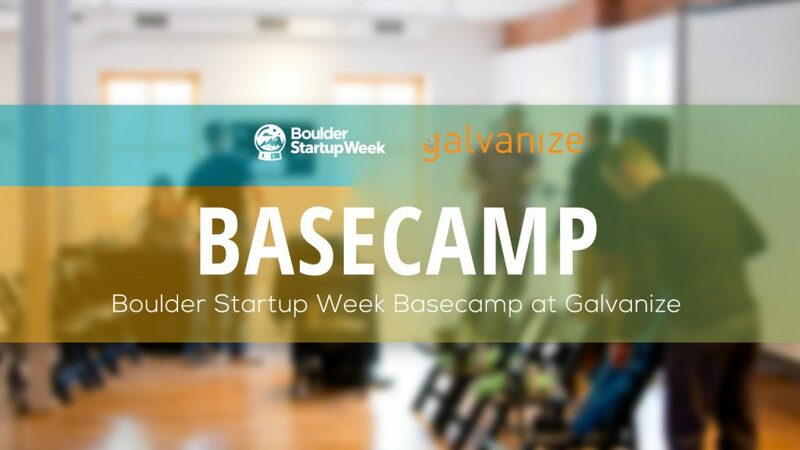 Open daily 8am to 5pm, stop by Basecamp to take a break, grab a free Boulder Startup Week T-Shirt (while supplies last) and learn something new! New this year, each day Basecamp will have a unique theme for the community to explore. Community members will have the opportunity to dive into the daily topic crowdsourcing innovative ideas on the walls and taking part in intimate workshops and talks. Check out the complete Basecamp schedule! The inaugural Basecamp Spotlight Series which will feature a variety of short (15-20 min) talks (followed by 10 min Q&A) throughout each day. Stop in between your other events to meet up with community members and listen in on valuable insights and advice. The Studio Arts Boulder Clay Lab where you can try the potter’s wheel or mold clay by hand. It’s a great way to clear your head and exhale between sessions! The Harvest of Hope Pantry Donation Drive. In addition to supplying fellow participations with brain-food, please also consider helping those in need in the Greater Boulder Community by donating non-perishable and hygiene items such as cereal, peanut butter, and razors. All donations collected at Basecamp will be going to Harvest of Hope Pantry, a non-profit providing food to Boulder’s families and individuals. The Pantry welcomes EVERYONE who walks through the door. Check out a list of what items can be donated here.